Our first PresPoll #1 survey launched on March 15, 2016. 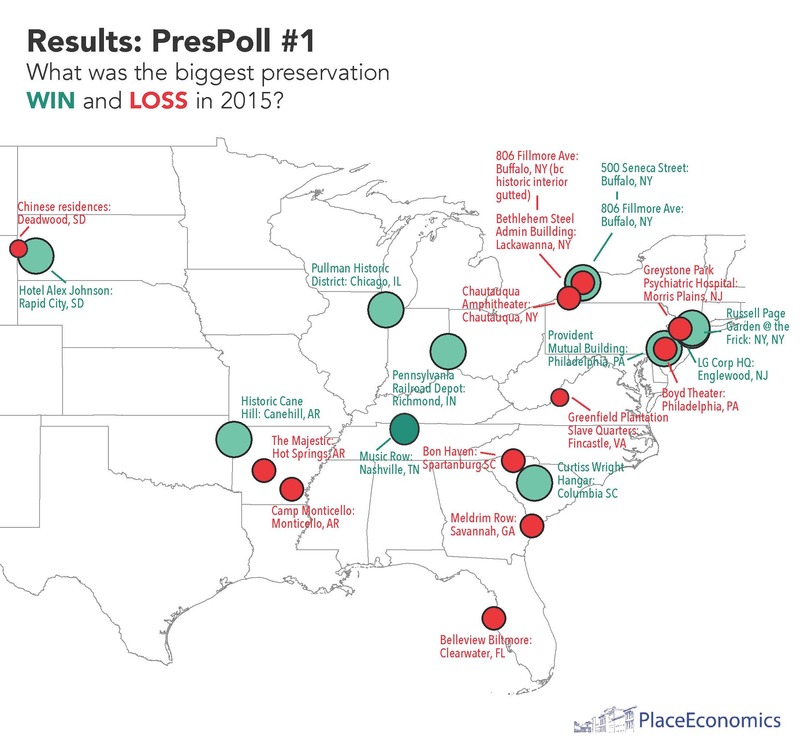 We asked two open-ended questions: What was 2015’s biggest preservation win and biggest preservation loss. Answers ranged from specific building addresses to tax credit programs to the loss of Syrian monuments. We mapped site-specific responses within the US, which you can see below. Red represents losses while teal represents wins, and larger circles represent more than one response for that site. For example, two or more survey respondents identified the Pullman Historic District in Chicago as a win and the Greystone Park Psychiatric Center in New Jersey as a loss. Other responses were not site-specific and included the Tennessee Preservation Act and expansion of Georgia’s rehab tax credit as wins, and Indiana’s blight elimination legislation and Palmyra, Syria as losses. Our PresPolls launch on the 15th of every month with a new question as well as results from the previous month’s survey. Stay tuned to our Facebook page to participate!